Nothing plays like a clean guitar. 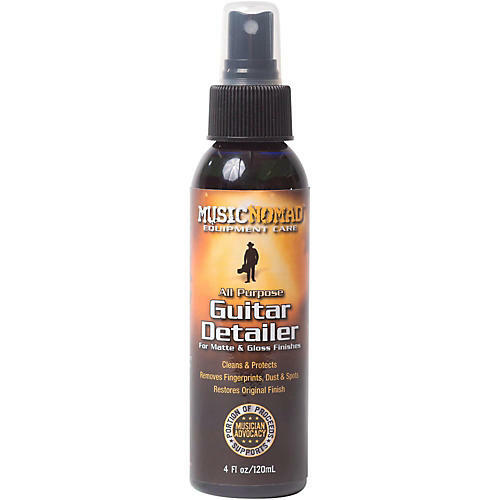 MusicNomad's Guitar Detailer puts everything you need to care for your guitar in one easy spray-and-wipe product. It works great on both matte/satin and gloss finishes. A single spritz from MusicNomad's atomizer cleans fingerprints, dust and smudges on your guitar finish like no other product. Whether you are cleaning your electric guitar, acoustic guitar, bass guitar or ukulele, Guitar Dealer makes your care and maintenance easier. The biodegradable formulation is infused with gloss enhancers and UV protectants to restore your guitar to its original showroom look. The anti-static agents help reduce dust from binding to your guitar. Small in size but big in results, you can take it everywhere, and it even smells great.